We've put together everything you need to know about selling fees all in one place, with easy access to latest tools and information. 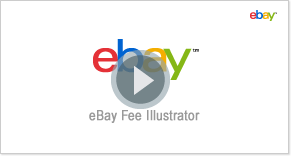 We've also included information to help you determine which type of eBay Store is right for you. How do fees work?Get an overview of basic selling fees. Where can I find out more about fees?Get details on fees and how they are calculated. Where can I review my account?Go to your account for a summary and to set up automatic payments. How do I pay my selling fees?Learn about the different ways you can pay your selling fees. How do credits and refunds work?Find out more information. What are the benefits of having an eBay Store?Learn more about eBay Stores and benefits of a Stores subscription. How do I decide which eBay store is right for me? Use our fee illustrator to calculate the cost savings for each type of Store, and to help you decide which one is perfect for you. We answer your questions around fees, free listings, Store subscriptions etc. We've enhanced our monthly invoices to make them easier to read and see your total amount saved through promotions each month.